A local product, hailing from Yarrambat and the Northern Knights, Godden was a stocky player who showed from the start that he played the game hard. During the week of his debut against Essendon in 1997, he was singled out by coach Tony Shaw as a player with the passion to play the game and the sort of player the club needed to promote. 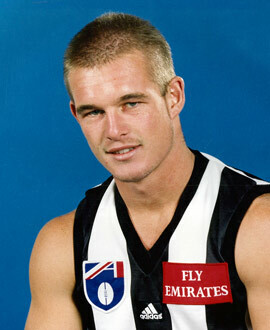 Playing predominantly at half back, Godden played the last 20 games of 1998 and took out the club’s Most Improved Player Award. He was a regular during the mid-way part of the 1999 season but did not play senior football after round 17, a day in which Carlton’s Simon Beaumont destroyed the Collingwood backline with eight first half goals. Godden was delisted at the end of the season as new Mick Malthouse sought to regenerate his list.